A City Council committee gears up to vote in June on proposals to rename Bayside Trail and Franklin Street in his honor. A 37-year quest in Portland to rename a public spot in honor of Martin Luther King Jr. may be coming to an end. 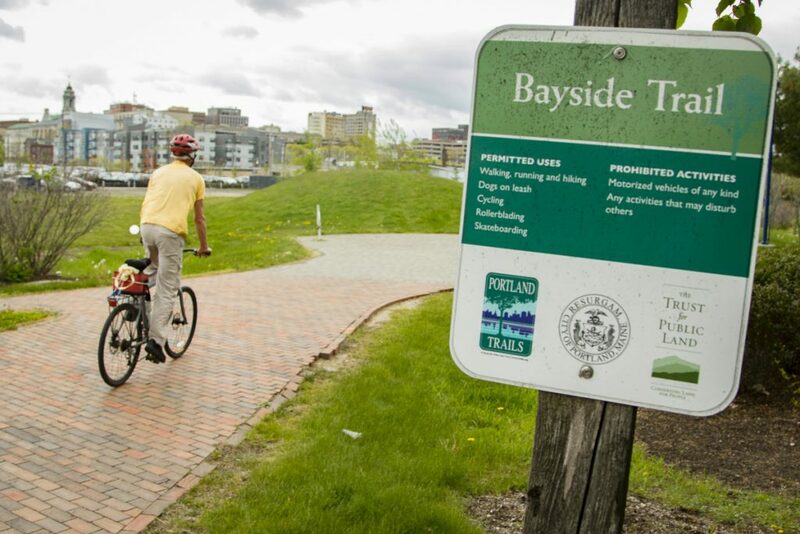 A task force set up last year to recommend a public space in Portland to be renamed in honor of King picked the 1.2-mile Bayside Trail, a walking and biking path connecting the East End to Back Cove that opened in 2010. And if another proposal to rename the Franklin Street arterial is approved, the city could wind up with two memorials to the civil rights leader 50 years after his assassination. The task force, which spent about a year considering possible spots for a King memorial, delivered its recommendation to the City Council’s Sustainability and Transportation Committee on May 10. If all goes according to plan, the new memorials could be in place before the year is out, said City Councilor Spencer Thibodeau, who leads the transportation committee. “Honoring King should be a statement that highlights his life,” said Thibodeau. The task force’s recommendation followed years of failed attempts to find the right place to honor King. Although King never visited Portland, he did speak in Brunswick and Biddeford. The University of Maine dedicated its Dr. Martin Luther King Jr. and Coretta Scott King Memorial Plaza at the Orono campus on the 40th anniversary of King’s death. There was an earlier push for a memorial in Portland that almost came to fruition in 2008, when another task force made the same recommendation for the Bayside Trail, which was then in the planning stages. A campaign to raise $750,000 for the memorial, including benches and other trail improvements, was launched, but then the Great Recession intervened, funding dried up and the effort fizzled, said Thibodeau. The latest task force, headed by Councilor Pious Ali, was set up in March 2017 at the request of the transportation committee after a proposal by Councilor Jill Duson and Portland City Manager Jon Jennings to change the name of Franklin Street to Martin Luther King Jr. Boulevard. That proposal was put on hold after about two dozen people, many of them still upset at the razing of more 100 homes to build the Franklin Street arterial in the 1960s, objected. 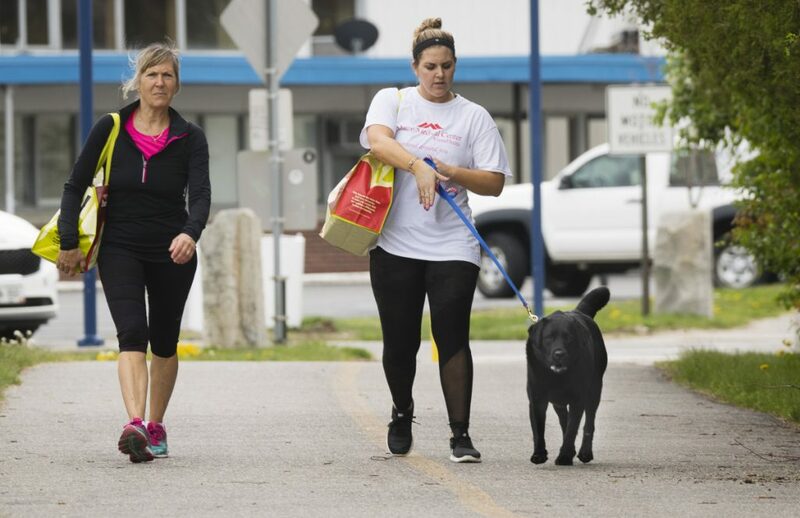 Lisa Lozier of Portland, left, who was walking Bayside Trail with friend Amanda Sebastiao of South Portland and her dog Ruby on Sunday, said she leans toward keeping the Bayside Trail name. The latest task force also considered three other locations for a memorial, including the proposed Portland Landing park near the Ocean Gateway terminal, Fort Sumner Park and Congress Square Park, but ultimately rejected those locations as inappropriate. In picking the Bayside Trail for the honor, the task force cited the recommendation by the 2008 committee. “The site is central, visible and accessible,” concluded the 2008 committee, which also envisioned specially designed benches, a statue and educational signs commemorating King. Thibodeau said the transportation committee is going to ask the task force to include renaming Franklin Street in honor of King as well. Thibodeau said he is hopeful that the task force would agree. He expects the transportation committee to vote on the double renaming at its June 20 meeting. “This is not going to sit in our committee,” Thibodeau said Sunday. If the measure succeeds, it will then go before the entire City Council. Thibodeau said the first phase of establishing the memorials, which entails changing the signs, would probably cost a few thousand dollars. The Maine Department of Transportation has said it could quickly change exit signs on Interstate 295 to reflect the new name, Thibodeau said. He said city staff has indicated it could make local sign changes by the end of the year if not sooner. He said the second phase of the project will include adding some sort of memorial that would explain King’s impact on history. The intent is “to tell Dr. King’s story in some shape or form along the trail,” Thibodeau said. He did not have any cost estimates for the second phase. 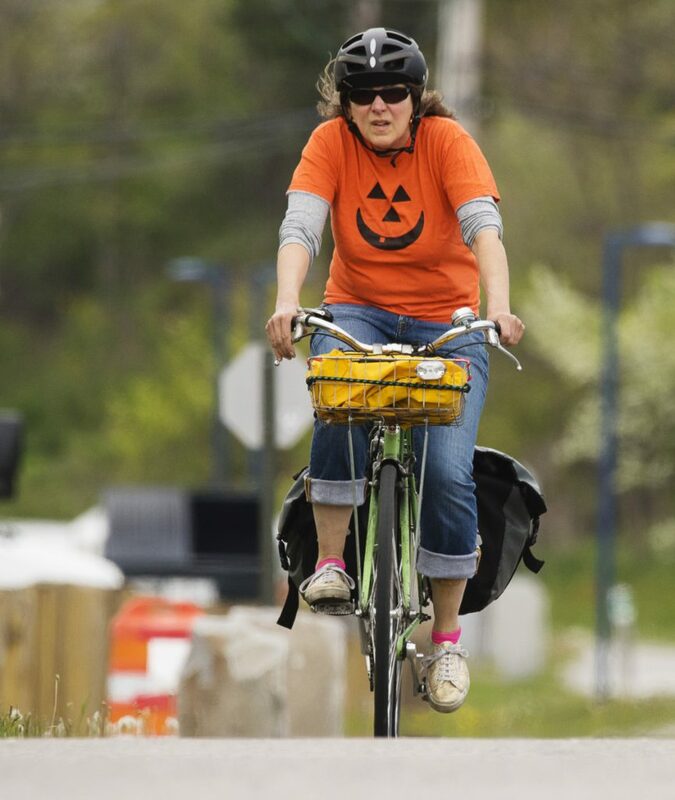 The Bayside Trail is used as a transportation route by bikers and as an exercise path for joggers and walkers. On Sunday, some trail regulars said they didn’t have strong opinions about the name change. “I am fine with it,” said Matt Hock, who travels the trail frequently between his home in the Parkside neighborhood and his mother’s home on Munjoy Hill. Karyn Jenkins of Portland, who often uses Bayside Trail to get to her business, said she really didn’t have an opinion about renaming Bayside Trail in honor of Martin Luther King Jr.
Karyn Jenkins uses the trail to commute from her home in East Deering to her business, Port City Bikes, near Deering Oaks park. She said she didn’t really have an opinion on the name change, but it would be great if there was a pedestrian-bicycle bridge over Franklin Street, which now requires stopping to cross at the lights at the intersection of Marginal Way. Stephanie Brown of Portland, who was walking her 4-month-old puppy, Jax, said she wasn’t aware the trail was named Bayside. She said the city should stick with Bayside because its proximity to Back Cove makes its current name appropriate.